On display now through April 1 in the museum’s exhibit hall, “Down South: From the Souls of African American Artists of Alabama” is the first exhibit produced through the museum’s Junior Curator program. Members of the museum’s staff worked throughout the fall with Valiant Cross scholars, providing them with hands-on learning experiences in researching and all the steps involved in curating a museum exhibit. The exhibit includes sculptures, paintings, photographs and mixed media works. The Junior Curator program is the latest partnership between the University and Valiant Cross. The all-male academy’s high school has been located on TROY’s Montgomery Campus since August. The museum has partnered with Valiant Cross on numerous activities, including a summer day camp for the scholars. 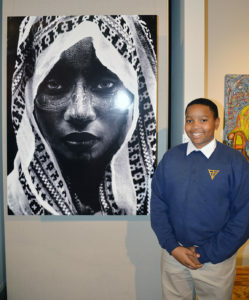 Valiant Cross Academy scholar DiAngelo Powell stands beside artwork he selected to be included in the Rosa Parks Museum’s Junior Curator exhibit, a photograph by Takeisha Jefferson. The Junior Curator program has had a big impact on the Valiant Cross scholars, Brock said. 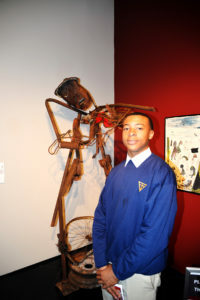 Valiant Cross scholar Jerome Harris took time explaining to visitors the materials used in this sculpture by Charlie “Tin Man” Lucas. 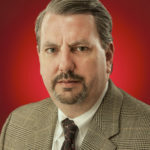 The students agreed with Brock’s assessment of the program. During Thursday’s opening reception, the scholars took their places beside the pieces of art they researched and shared their knowledge about the pieces as visitors passed by. Across the exhibit hall, Valiant Cross scholar Jerome Harris explains the materials used in a sculpture by Charlie “Tin Man” Lucas to visitors. The exhibit is available for viewing at no charge during the museum’s hours of operation, 9 a.m. to 5 p.m., Monday through Friday, and 9 a.m. to 3 p.m. on Saturday.